Looking to celebrate the new year a little differently this year? 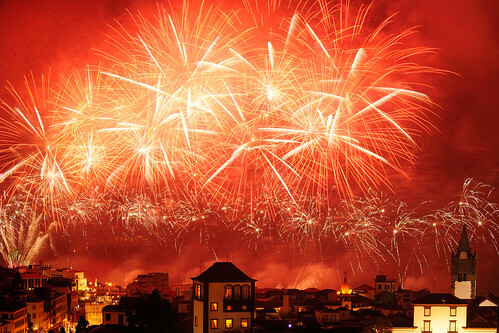 Why not visit Madeira Island and leave 2018 behind and welcome in 2019 with a night full of fun, laughter and of course pyro. The stunning little island of Madeira gained entry into the Guinness World record book for the ‘biggest fireworks display’ in 2006, so you can be assured that the evening will definitely go out on a big bang. The Islands Capital City is Funchal and it is acknowledged as one of the most picturesque and cleanest in the World and there are plenty of activities to enjoy all over the Christmas period and all the hotels, restaurants and bars join in on the island’s festival, the main attraction is saved for New Year’s Eve as this is what Madeira does best; FIREWORKS. Set in the beautiful Funchal Bay, spectators can experience a 360 view. The bay is right in the middle of the town and with the slopes of mountains, trees and brightly lit houses surrounding either side making this a perfect amphitheatre in to which to hold the fireworks display. The best way to watch the show is from the sea, and there are plenty of ways that you can this whether you hire a boat yourself or climb aboard a passenger ship with a bar and restaurant onboard, or if you prefer to feel the wind in your hair you can climb aboard the “Santa Maria de Colombo” known as madeira’s pirate boat, a replica of Christopher Columbus flagship. You will notice water around the area will get as crowded as the land as cruise liners make a beeline for this spot to witness the technicolour show unfold. If you can’t find your sea legs and prefer to stay on dry land, there are plenty places you can get a view of the show. Around the marina is a popular spot or on one of the many rooftop terraces and bars of the hotels and restaurants in the surrounding area. If you don’t take to the water, then make sure that you arrive early as the areas can get filled very quickly with both locals and visitors. As the clock strikes 12 the skies above the bay are filled with an abundance of colour, light and every effect possible as the fireworks display begins. There is no expense spared on the show with a cost of over 1 million euros spent in previous years. The show lasts around 8 to 10 minutes and they are fired from over 50 points in the area giving maximum coverage in this non- stop pyro show rated one of the best in the world. Don’t worry if you can’t get there to let in the new year there is also the Atlantic fireworks competition held here during July, so make sure that this is out in your diaries as this is another show not to be missed!! 2018 got off to a great start in the UAE with them successfully managing to launch the biggest recorded aerial firework shell. The record was previously held by Kounosu Firework Festival in Japan on 11th October 2014 which weighed an impressive 1024 kilos. The new record saw a shell weighing in at a massive 1089 kilos with a diameter of 1500 centimetres (that is just under 5 feet in old money!) burst in the skies over Al Marjan Island. It was absolutely SPECTACULAR and began with a ground break from which the shell was launched giving the effect of a beautiful emerging flower. The huge shell burst into a huge gold with silver tipped brocade changing from yellow to red as the stars floated majestically to earth. The display was brought together to celebrate the beauty of the man-made island archipelago and was choreographed to music from around the world to encourage further tourism to the region. The preceding display was under the watchful eye of Fireworks by Grucci, one of the original Italian Firework families who has been in the business for six generations and continues to delight all who see their magical displays. Most famously, they have been responsible for the Presidential inauguration fireworks for the last 8 presidents. Tiana’s New Year EPIC Blast! We have had another visit at Epic headquarters from the popular You Tuber Tiana. This time not for hitting incredible heights of subscribers but to celebrate the new year in Epic style. 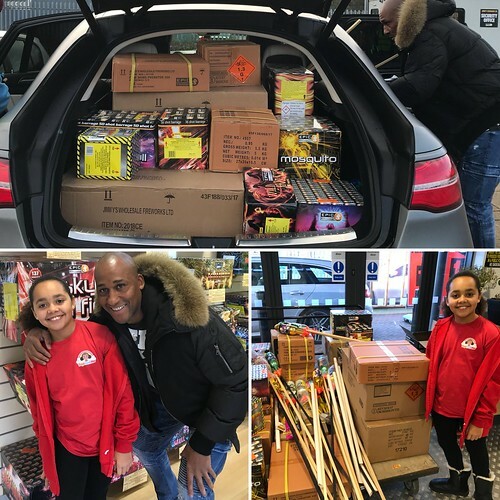 Check out some of the Awesome range of fireworks we have supplied to them including our ever-popular Constellation, Sky on fire, Wild Horses among many others. Happy new year from everyone at Epic fireworks and all the best for 2018!